When we built our house we had a closet underneath the stairs that I had no idea what to do with. My husband and I dubbed it the kissing closet. *blush* Since it's under the stairs it slopes down to the back and it's pretty small. What do you do with a closet like that? For awhile it stored all my photo props plus the vaccuum, broom, and mop. I felt like it had so much more potential. 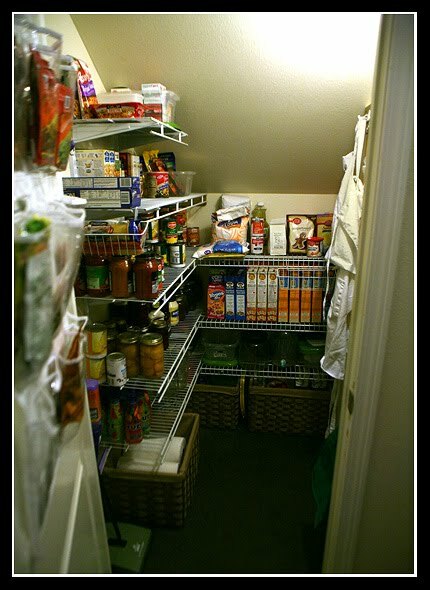 So, one day when I was unloading groceries and cursing how full my cupboards were I had an epiphany! Why not turn the kissing closet into a pantry? It was one of those moments where you feel brilliant for thinking of it, but at the same time incredibly stupid for not thinking of it before that point. I took my measurements and drew up my plan. It cost me about $120 for all the hardware and took me about two hours to complete. It was some of the best money I've spent on my house. Here is my small, but functional, pantry. I decided to post about my pantry because of an idea I had. 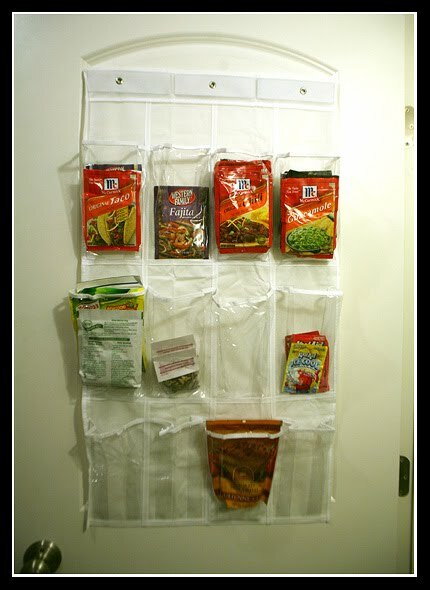 I saw a picture of an over-the-door shoe organizer that someone used to put kids snacks, medicines, etc. It occurred to me that it would be perfect for spice packets such as taco, fajita, and chili seasonings, onion soup mix, cool-aid, etc. I kept mine in two baskets and could never tell what I had. Enter the solution! This clear over-the-door shoe organizer works perfectly! I didn't need the whole thing so I cut it in half and hung it using those little double-sided foam strips. Now I can see when I'm low on a seasoning. Plus, if you have a friend that wants to do the same thing you can split the cost of the shoe organizer since you cut it in half. Tip: Place your seasoning packets with the closest expiration date in the front so you will use it first. You are so creative! 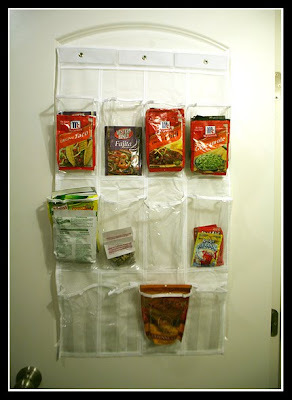 Your pantry looks awesome! Great job! I am just in awe of your innovation. Love that you called it "the kissing closet." Too cute. 2011 Installment of "Got Lefse?"